Some good, some bad news. Although temperature could be a lot better, still we cannot complain all too much, because it rains a bit, most of the time in the evening or night, so at daytime you can be outside without getting wet, and if the sun is peeping through the many clouds, it even feels rather nice. All could be better, of course, we didn;t had much of a Spring, so let's hoppe for a good summer. Yesterday in the mailbox we had some good and some bad news. One was a letter of the health insurance, that the allowance Jan received had been stopped, because he had an agreement with their doctor that he could be at work again from the 27th of May. But that isn;t completely the way it was agreed with the doctor. That man had a few weeks ago a conversation with Jan and according to that the doctor wrote in his report that it might be possible that Jan started to work again by the 27th. But he also told him, that if jan though it wasn;t yet possible, he should call him about a week before the 27th and telling him about the progress and eventual re-start of work. So Jan did and told this guy, that he was doing his best and may be he needed another 3 weeks and then would try go back working again. 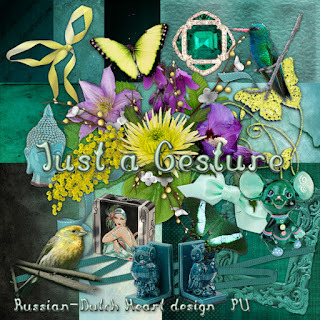 Doctor understood and said to Jan that it might be possble he would get a call by letter to appear at the office for another health check and / or conversation. I thought that was okay, and understandable, but now they just assumed he was ready to go to work at the date of the 27th and from that day Jan wouldn;t receive any more insurance money. And we do need it, of course, bills have to be payed. Well, Jan will make a phonecall to the doctor he had the last appointment with to know why this letter is sent to him, although he had a different agreement with him. It might be, that different departments of the health insurance are working at cross purposes(which unfortunately happens more often than you think). Hopefully there will be found a solution, If not, Jan will have to go by the agency today too, to say he will be back for work as from Monday. I hope it will not be too soon, but from somewhere money has to come in. And even if we would ask for temporary support of the social services ( you can have also a partly support if you cannot work enough for a decent income) that would probably take some weeks to get through. We'll just have to see how his back will hold and his whole comdition, he is much better but I am not at all sure it is as good as he says. We also had a nice letter in the mailbox, from the tax office. Jan is recieving some money back, and it comes just in the good time( with all that helath insurance thingy), Now we hope I too will receive some money fro the tax office( according to our accountant I should). If that's so, we have a bit back up money. Okay, we will see how all things go, somehow we will survive it, and may be life will smile at us again in the second half of this year LOL. 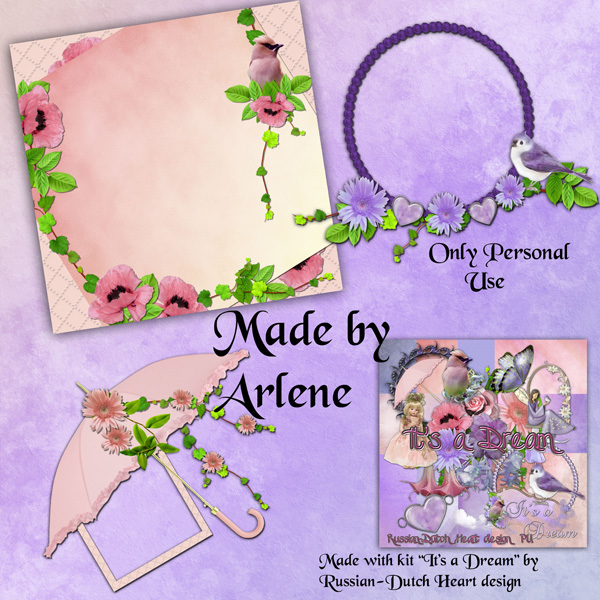 Did you see perhaps the layout I made for my friend Edna? 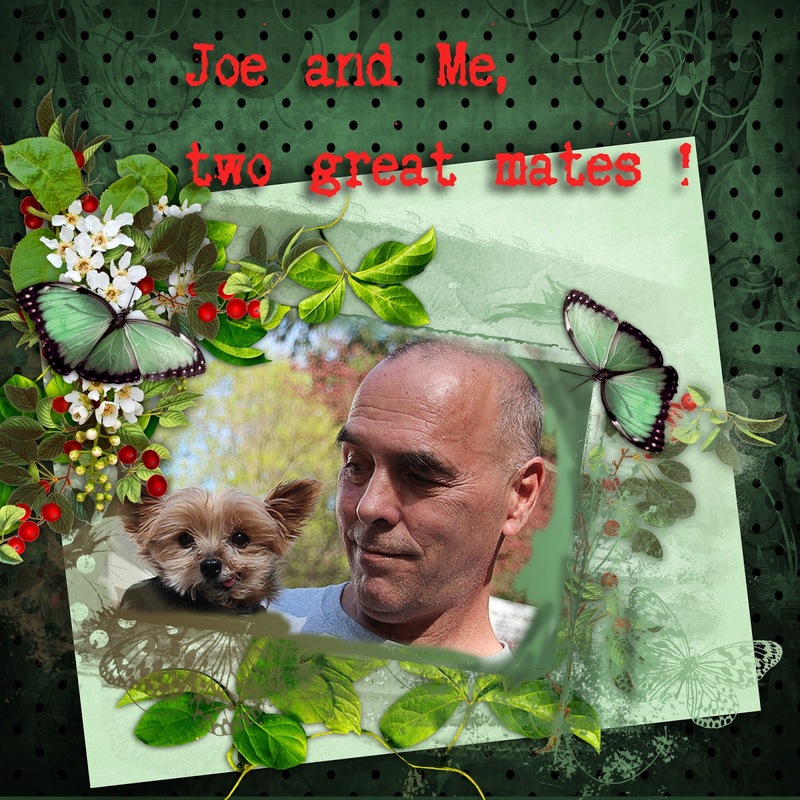 It is the phot of Pogo ( her doggy) and Joe ( the doggy sitter when Edna is at work). I thought it was such a nice photo it deserved a layout so I;ve made one for her to chear her up. I told Edna, that it is a good thing she shows so many great photos on her blog, so sometimes I can snitch one and practice a bit in making layouts. I do that not often enough and really, I loose a bit the creativity and skill for that. Anyway, thanks to Edna, I can have some fun making layouts for her LOL. On to the freebie for today, and I'll throw in another Nutshell kit, named "Serenata d'Amore". with clusters from Arlene, you can make a striking layout, I hope. If this weekend the sun will pop out from time to time I may have a picture soon of a first rose bloom of my climbing rose. Some of the buds are close to open. Now have a wonderful weekend. Weather is driving us mad LOL! Well, we had two real nice days, but today temperature has dropped again and it's not springy anymore. Oh, our seedlings were jumping of joy the last two days, because they had lots of sun and their feet could get dry a bit LOL! And as I was on snail hunting yesterday evening, I encountered two frogs, one very small youngster and an older one. Hoorray, they are still around. Jan's check up with his doctor was okay, so happy to hear that. Now we are waiting for a call from the health insurance doctor, and Jan has the idea that in about two weeks he could start working again, but only partly, it wouldn;t be wise to work at once a whole week of about 6 days. Hopefully he will soon have the appointment with the insurance doctor and will come to an agreement of partly working and partly getting money from the insurance. Let's hope his back will hold and not cause him too much trouble. It is much better, but he souldn;t overdo it for now. Because I didn't do very much the last couple of days, I really should do some laundry and ironing and more today again. Not my favourite time spending LOL, but it is necessary. Every day something will do the job too. I have nothing more to ramble about, although I am sure I am forgetting something. If it is of any interest it will come back into my mind and I can write it down oin my Friday post. 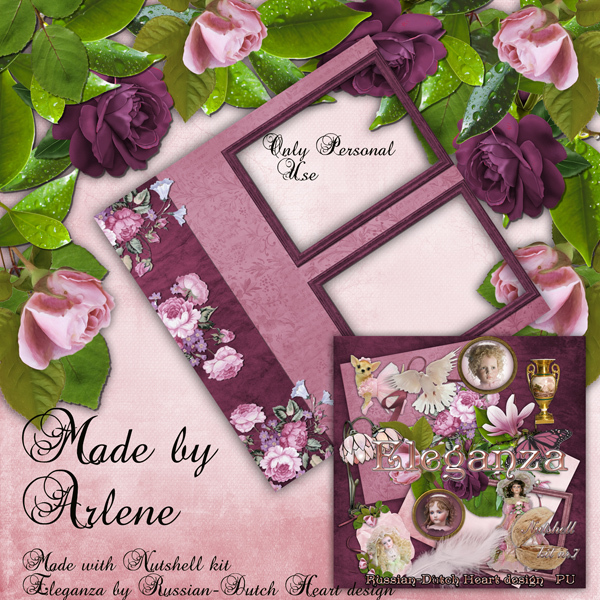 Today I have a kit for you in a single colour pallet, ( at least the papers) together with a beautiful add-on from Arlene, also containing a quickpage. Kit is named "Just a Gesture". And now I should get moving, if I want to have anything done in the house. Today we should enjoy a lovely day. Weather hasn't been as bad as we thought this weekend. Not that it was warm, but at daytime we didn;t have rain and even some spots of sun. So Friday was the worst day, and therefore I went to the supermarket with the tram, it's the market where I go sometimes when I need specific things, and it's there the cheapest. Back home I got rid of some dust bunnies and went around with the vacuum cleaner. Saturday was a better day, so first I went out for the newspaper and took a quick tour at the fair. And I came home with 4 second hand books. Two novels, one garden book, with just simpe, tips and advice for gardeningn which is ideal for Jan and a little cook book for pastry. All that just for ONE EURO! In the afternoon Jan and I got busy in the garden. Remember i told you we collected some great planks at the street? Well, we made a great place for the plants nursery with them. It is placed at the spot where we had metal rack standing( at the terras where we sit) and it looks great! We have more place for our seedlings and it also looks a bit more organized this way. Now we had the metal rack as spare, and we found a great place for it in one of the borders. At the moment there are two long containers standing on it with onions ( I have no idea if we will have onions later this year, but it's fun to try). Later on we can put some pots on it with flowering plants. And I've made you a photo from our azalea again, now in full bloom and it looks gorgeous. Yesterday we could even sit for moment in the sun, although you had to have your sweater on. But today temperature suddenly rises up to around 65-70 F, with almost no wind. Just for one day, tomorrow it will drop again about 4 degrees and some rian again. So the quote "Carpe Diem" , ( pick the day) applies for this day. Jan has to go to his appointment with his doctor at the hospital . She keeps him under strict control, and that is a good thing. And then I think we will just enjoy this spring day, may be I will start in one of the two new novels, comfortable sitting in the garden LOL. Today our street is having more mess, they started digging again this morning, and we even are without water supply for a little while, hopefully just for an hour or so. What do I have as freebie for you today? 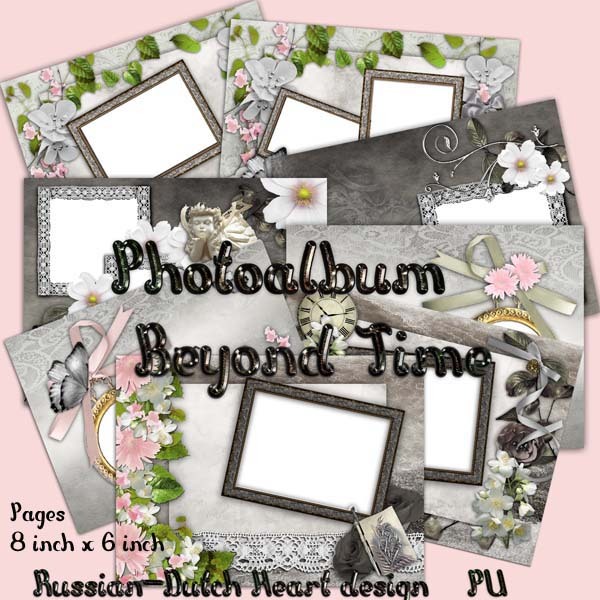 I have another photoalbum for you, which I made with the Beyond Time kit. 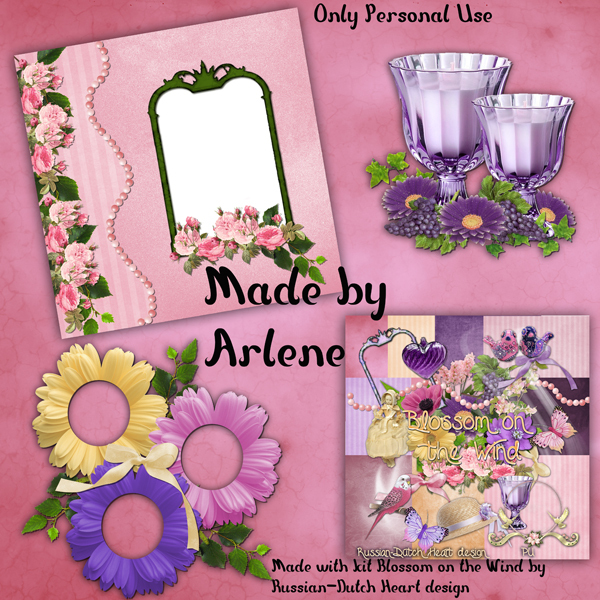 I hope you can use it, and as an extra I have two lovely quickpages from Arlene. Time now to have another cup of coffee and then get dressed to be ready for a sunny day. Lots of rain, it goes on! No, the weather isn;t yet how it is supposed to be. Too much rain and it is cold. Sometimes we have a moment of sunshine, but even then it is not really nice to be outside. Grrrr, what is the matter with the weather all over the planet? We still hope for better times, but if it goes on like this, we surely ill have a short summer. Sometimes you can find the most nice things along the street, did you know? People do change their homes, or do some cleaning up and they put all the stuff along the treet(when you have a lot you can call the city hall,where there is a department for "big stuff garbage"and they come to collect it. Wednesevening Jan put out the normal garbage sacks on the street for collection and came into the house and called me to come with him. Oh my, we found some great lovely planks we could use, and some other full wooden ones, so we took them home LOL! The planks are now in the bedroom to serve as book shelves. We had shelves there, but they weren;t quite the ones needed. Now it looks a lot better. The other ones we probably will use in the garden, they have a little upstanding side, so I think we will put them on some bricks and they will do fantastically as nursery for seedlings and also I will put some pots with flowering plants on them. If you have to buy them in a shop, you have to pay a lot money for those kind of shelves. We still have a spot we want to make nices in the garden. That is against the wall of the little shed. It is mostly in shade, so I will have to look for plants that will do well in shade, but there are lots of them, also flowering ones, so I hope to have that finished soon. Also want to put there some nice flasks or pots or other fun things in between, to bring even more color. We only need a bit nices weather. Our street is now becoming really messy! They emoved almost all the tiles of the sidewalk and the digging will start soon. It isn;t easy to get to the front door anymore LOL. This weekend, starting today, there is again a fair in our shopping street near to our house. And every year again(some exceptions you always have) they have not good weather. Amazing, but true! poor souls that have to stand 3 days in their stands, in the wind, rainshowers and that together with low temperature. Not something to become very happy! I cross my fingers for them that along the day may be some sunshine will appear to make it a bit bearable. That's about all I can think of to tell you, not very exciting, I know, but that is life. Better I make you happy, perhaps, with the freebie. 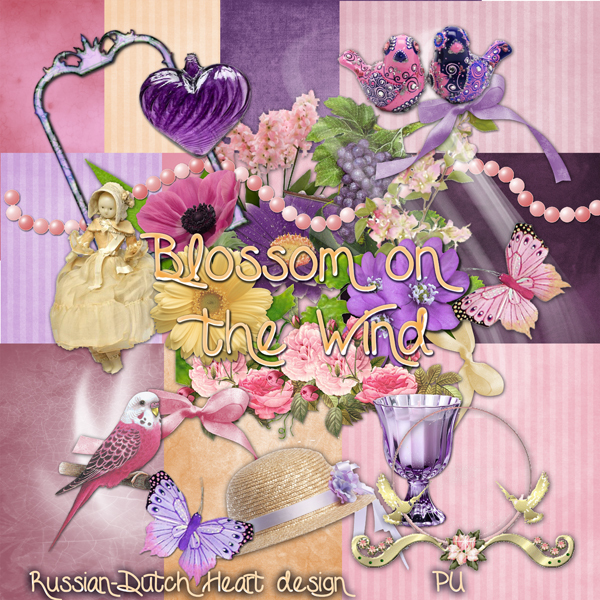 Perhaps this one can bring a bit of summerfeeling to you, Blossom on the Wind. And I am certain that Arlene's contribution will help too. 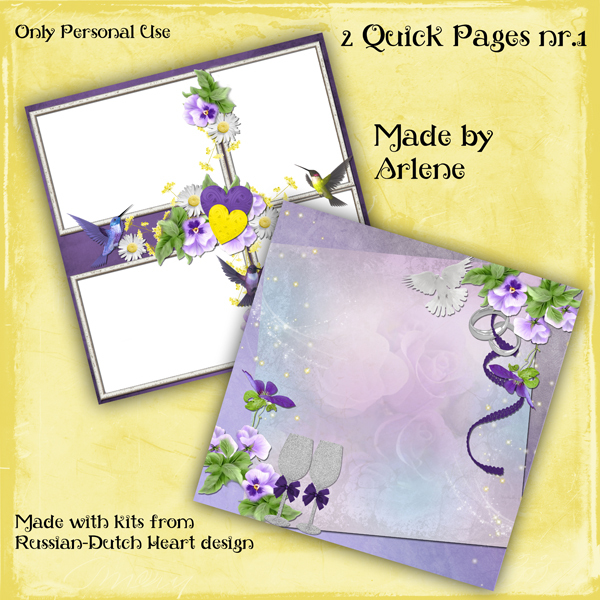 She made two lovely clusters and also a wonderful quickpage. I will stay at the computer for a little while longer, perpas work a bit on a new kit I started yesterday, and then I think some dust bunny hunting is necessary with some vacuum cleaning LOL. And meanwhile I will cross my fingers, that we will be able to see some sunshine, at the moment it is very grey and rainy outside. Have a wonderful weekend and stay safe! It is really unbelievable, but it is almost autumn weather. We had a lot of rain, and real cold temperatures, about 9 degrees lower than it should be this time of year. Jan went out the other day to look if he could find some mini diving equipment for the seedlings and other plants, but there weren;t any to find! Such a shme, I would have loved to see them all with the diving mask on and then take a picture LOL. Not too much happened the past days, well, it was not the weather for it, we stayed in a lot, I did some things in the house, and yes, it looks as if Brodski is on the mend. He is eating better again, even goes out for a moment, and yesterday evening he came sitting on the couch again. He isn;t sneezing a lot anymore, so I have good hopes. I will try to put on some more pictures I took of the garden, the one lovely spring day we had on Sunday. No, still impossible via the Picasa, so i will do it via Tiny Pic. Here the right side of the path. Above you see some seedlings of herbs, slowly they are popping up, the front two should become poppies. This one I took from the back of the garden, looking a bit direction terras. And here a close up from a gerbera we bought lately, couldn;t resist it, just a lovely color! Hopefully you can feel a bit better, despite of all the strange weather circumstances. Like the tornado's that are sweeping over the US at the moment. Then we here must not complain, those poor folks have to endure a lot, and sadness too with all the casualties. 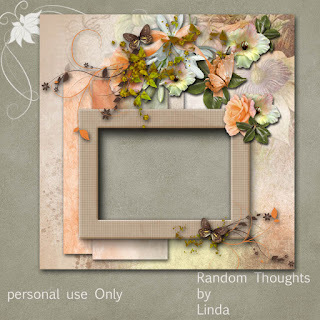 To end on the bright side, I want to show you a quickpage Linda made from a kit of mine. You can download the freebie on her blog. This lady is a real artists, don;t you think? Now the freebie for today. That will be a Nutshell kit again, named it Il Passato ( the Past). First weather talk. Weather was improving a bit and yesterday it was just lovely. We reached about 68 F, and it was enough to sit in the garden and it was lovely. We had good hopes the improving would continue this week, but as we saw the weather forcast for the next few days we were really disappointed. Temperature will drop to very low for this time of year, not much more than 53 F and the days will be rainy! You sure get a bit discouraged seeing that! I don;t know what is the matter with the weather but it isn't acting normal. Oh my, I had a busy day on Friday. After the posting and a it playing around on the computer, I got dressed and went into the kitchen. And I baked the pie, the "pirog", it took some time but it turned out well. Only next time I just have to let it stay in the oven a bit shorter time. he top was slightly too dark. I didn;t make a photo of it but I have an example I found on the net. On this picture it is filed with cabbage, I made the filling with minced meat, lots of onions and hard boiled egg ( cut in little pieces). And I sure can tell you it tasted wonderful! In between the making of the pirog(the dough had to rise twice), I started also making the soup, all with fresh veggies, little minced meat balls and a bit of vermicelli). I can assure you that when you have a bowl of soup together with a piece of pirog, you have a good filled stomach! it was yummie. I also did some dustbunniy removal and swept around the vacuumcleaner. When all that was done, you always have quite a lot of dishwashing to do ) I was a bit pooped out, but oh so satisfied! Saturday Jan and I just went out to buy us two sacks of soil, and yes, we also came back with 3 very sweet plants for the garden. 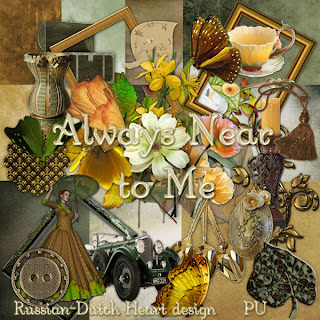 Yesterday we did't do much, we just enjoyed the lovely weather, although Jan went out for a ride on his bike, to see how that would go, he went to Scheveningen,to the beach, where there was a regatta. I wasn;t really in the mood for it, I just wanted to to stay home, have some reading in my garden magazines in the sun and keep an eyeon our cat Brodski. The poor thing surely catched a cold last week, it started on Friday, he sneezed at times and also sometimes he had an attack of "coughing"you could say. It was morean urge to vomit out some slime that troubled him. So of course I was worried about him. He didn;t do much more than lying on a chair, sleeping a lot. I already was thinking about going to a vet on Saturday, if there wouldn;t be any improvement. But on Saturday he was looking much better, he reacted again as we approched him, he even did eat a bit, didn;t sneeze as much as before, also the slime couching was less. So even though I still wasn;t re-assured, Jan said we should wait a bit and see how it goes. Till now it looks as if he improves, so we give it some more time. as it was such nice weather yesterday I took my camera and made you a few photos from the garden again. Last week or so I posted a few, when you compare you can see really changes. Sorry Ladies, suddenly Blogger won't let me upload pictures anymore. Probably has to do with some changes they made again. I found another option, yeah! I upload them on tiny pic and paste the url and now it shows the picture. Something isn't working at the moment from the Picasa. Anyhow, I can show you some pictures, I think I will post some today and some on wednesday, okay? In the back you can see my azalea, in full bloom now. On this one the little "rock-garden"in front still quite some open space, but if all goes well, some seedlings will have to grow there. Here some chives, that survived winter and how lovely it can bloom! That's all for now, I hope next time I can upload more easily the rest of the pictures. On to the freebie then. Not too big kit, but a sweet one, I think. 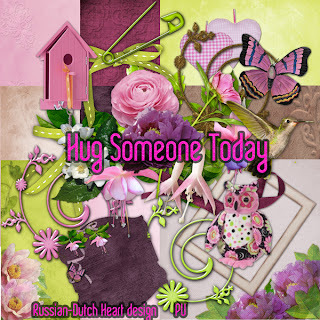 Named it "Hug someone today", with 3 nice clusters from Arlene. Today i plan to have a bit busy day LOL! Spring has left us a bit, at first the little and big plants in the garden were jumping of joy because of some rain. But now they don;t look too happy anymore, there are getting too wet feet LOL! It is about time we got back some of the nice spring weather we had some time ago and then it should stay for a longer period! wednesday I went to the annual appointment for my lungs, and oh my, that has taken time! I was there on time, even before, but had to wait for more than an hour till I was received by the doctor. Such waist of time. I can understand that there can be a little delay, but I think that an hour or more is too much. But, once I was in his chamber, I was out quickly too again. As all goes well, we didn;t have much to discuss, he listened too my lungs, they were as they were, so I got my prescriptions and for next year I will get an appointment for a lung photo, just for control. Now I just have to go to the neurologist in June, and then hopefully we are done with doctor visiting. After I finally got back from the hospital, Jan had done some floor cleaning in the kitche and hallway and toilet. So sweet of him. So I took a cup of coffee and then went to the market. I found some nice fresh veggies, like a bunch of 5 courgettes, some paprika, leek, garlic, new potatoes, mango and apples. Apart of the potatoes and garlic, I didn;t pay more than € 1,00 for the each of the other things. That really is a big difference from supermarket prices! Back home again, I put on the meat for a stew, where I used some of the veggies too, and potatoes and after a couple of hours of the stove, we had a good dinner with it. And as dessert a bit of yoghurt with some fresh mango, yummie. So yesterday I and Jan too, took it a bit easier, after I did a quick shopping of things that were needed in the fridge and Jan went to the city council to give them the papers for the good-conduct declaration he needs for his work. For some professions it is required to produce one. It's rather easy money earning for the council, Jan had to pay € 31,00 . Today I want to spend a bit of time in the kitchen, making a "pirog"for the weekend( kind of Russian pie) and make a soup too, so I don;t have to bother about dinner today and also not for tomorrow. The the house can do with a bit of dust bunnie clearing and a vacuum cleaner tour, well, I can do that when the dough has to rise, and hopefully this priog will taste about the same as the one my mother made! Tomorrow we probably will watch the Eurovision contest. Although it is not the same anymore as it was years ago, it is nice to watch and even there are sometimes some really great songs. Jan and I always have fun with it, we make a list of the countries that compete and we give them a figure from 1 to 10 and at the end we'll see if some of our favourites ended up at the first places. I must say not verymuch of them got a figure above an 8 and then we already think it is a really good song LOL. But often some of our favourites end up at the end of the list. Oh well, as long as we had our fun, I cannot be too bothered with it. 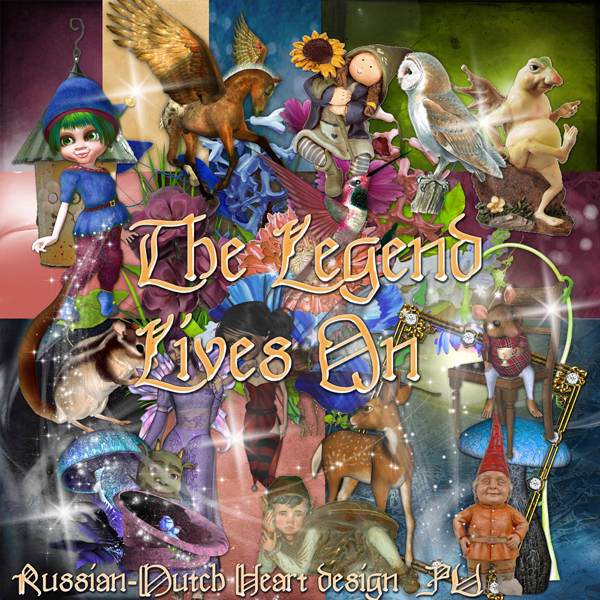 I must say that for once in a loooong time The Netherlands have a not bad song, it is a bit different from the others( we did see some of the semi finals already), but I don;t think it will be a winner. Enough bla bla for the moment, I want to start my activities not too late so I will be done with it in the earlier afternoon. The kit for today is one I really like, it's a bit romantic, perhaps you could call it even a bit Vintage, love the way the colors turned out in the pages. 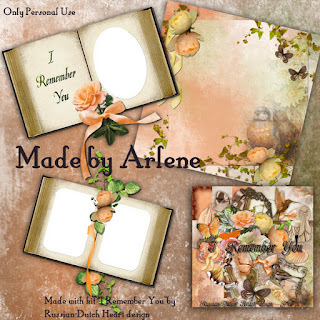 It's named "I Remember You"
Oh and Arlene, made a super add-on for you. 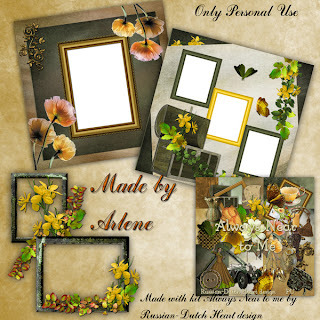 two frames and one quick page! Have a wonderful weekend, have fun doing some scrapping, see you on Monday! 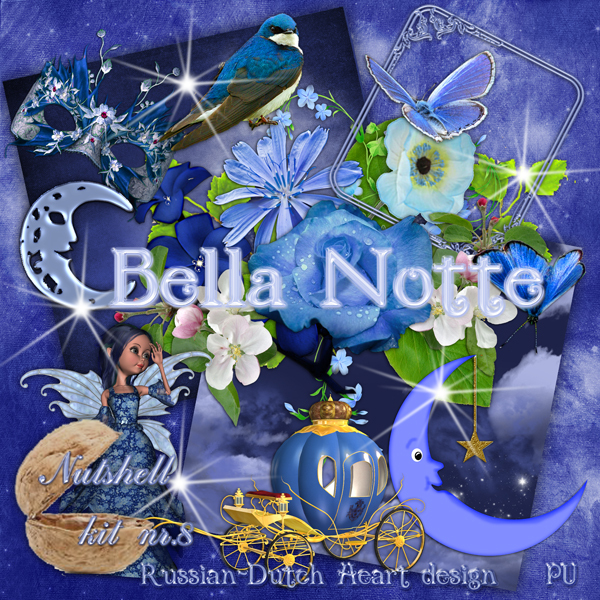 It will have to be a short post this morning, I will have to leave soon to be at time at a doctor's appointment, don;t worry it is just the annual control for my COPD, so it will take more time to get at the hospital and wait to have the chat than the actual time I will spend with the doctor LOL. Let's see, what did i do the last couple of days? Oh yes, Monday I the sheet chaning on the bed. Did a little bit of re planting in the garden. We have had some rain(it is raining now again), but we arestill a bit lucky, there are moments that the sun is coming through. Now we only need the temperatures go up again. Yesterday I did a bit of food shopping, and also did a laundry, etc. On Monday I also shortened Jan;s other new pair of trousers, once started it is done rather quick, but I am not a great fanatic in sewing, glad that it's done LOL. The mess at the street I talked about some time ago has started today. They started to remove the tiles of the sidewalk, so I gues the digging will start soon. It's for replacement of the sewer pipes, sigh! First we had the gas pipes, now this one again. But we will survive it, I guess. If it will become a little bit drier later today, I want to go to the market. We could do with some fresh veggies and some fruit too. And there is a lot of difference in price between them buying them in the supermarket or at the market. It's a lot cheaper at the market! Have to finish now, have to get ready to leave soon. 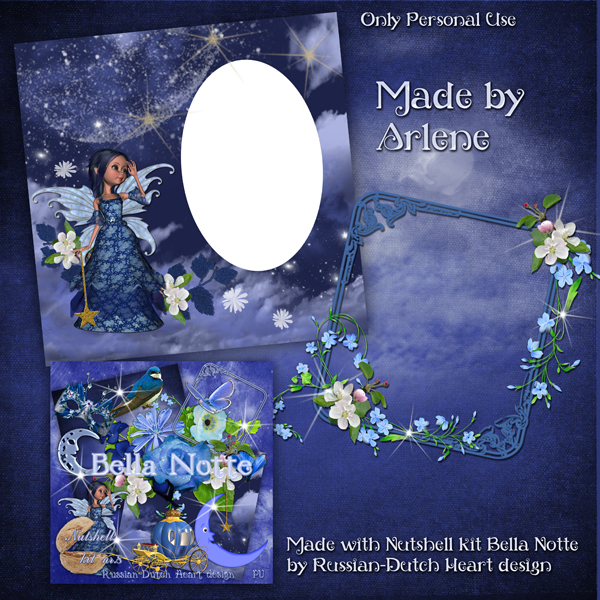 Today I have another Nutshell kit for you, named "Bella Notte" (beautiful night), all in blues.With a marvellous quickpage and also a clusters from Arlene. Spring has left a bit. We were looking forward to a bit of sunny weekend, with some nice temperatures, so we could catch some sunbeams in the garden. Well, that wasn;t the case. Temperatures have dropped considerately, there is a too strong wind, and we have had some rainshowers, so not too bright all together. still there are moments with a bit of sunshine and on Saturday there was such a moment, so we decided to take a bit of fresh air. 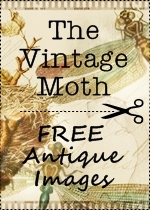 On flyers there was announced to be a Antique/Curiosa and bookmarket close to our street, so we thought that might be nice to look around a bit, you never know what you can find. But when we got at the street where all this should take place all we saw was just an empty street!!! It was rather a disappointment, and we encountered more people who came to see this market and were disappointed too! Perhaps it was cancelled due to the weather, or perhaps they didn;t have enough stands, I don;t know, but it sure would have been nice to let the public know. so we just made a little walk, bought our weekend edition of the newspaper and went home again. This was about all activity that we had for the whole weekend LOL! It was no garden weather, so I did a few little jobs in the house, and then I spent a lot of time at the computer. Jan had his new crossword and the newspaper, then some sports to watch on tv, so we had enough to do to pass the time. Nevertheless I did make a quick round in the garden on a dry and bit of sunny moment, we have to keep an eye on all theseedlings and other plants that start to blossom or are developping buds. Some seedlings really seem to start growing, and the climbin rose is making lots of buds, so in June I hope to have a lots of roses flourishing. 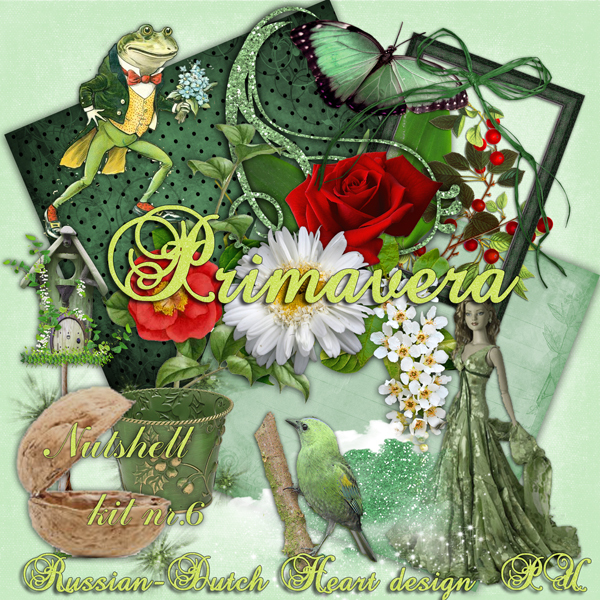 Today I have a fantasy kit for you. 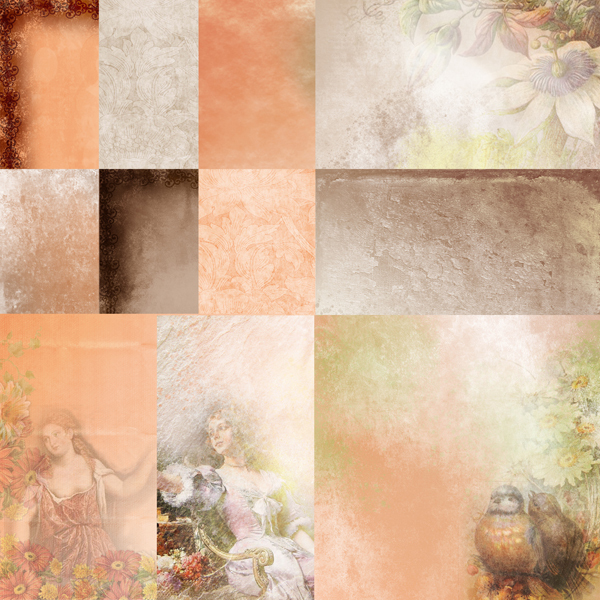 It's been a long time ago that I made one, and may be it's a nice one to make some layouts with little children? 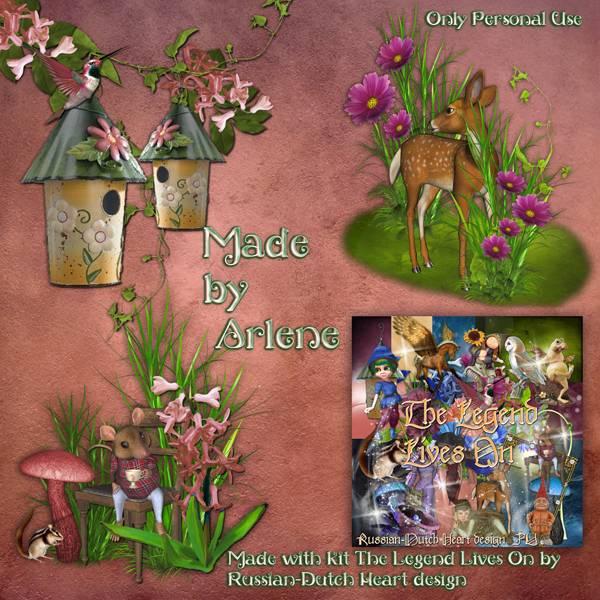 It has some gnomes, and fairies and such in it, and Arlene made some sweet clusters for you. It's named "The Legend Lives On", and we should keep our fantasy alive, because at times we just are for a moment a child again. At least, I have those moments and I have no problem admitting that LOL. we still have rather good weather hear, although temperature has dropped again a bit. The most annoying about it all is that the wind is a bit strong. The other day we had some rain, I could hear all the plants and seedlings sing from happiness LOL! Yesterday we watched a couple of nature programs on tv, and you know, it doesn;t matter how often you see them, nature still keeps amazing us. One program was about all different clouds that appear in the sky, and I must say, I never knew there were so much shapes and sorts of them. I found you a link where you can see about 30 different kinds of clouds and with a short description of it. Really beautiful pictures! Then we saw some program about spiders, how they are so differnet, and how they make such diffenerent kind of spiderwebs, to catch some food. Oh my, it were real micro clos ups, amazing! I believe this last one was in the BBC, with comment from Sir David Attenborough, the best of all! He now has already 87 years of age, and it is amazing how he comments all the different documentairies with a ever going on enthousiasm and knowledge, I like the tone of his voice and he will be missed extremely, once he will pass away. Found you one of the many documentairies on line, and if you can spare some time during this weekend, take the trouble to watch it. You will see and hear extra-ordinairy things, and then you realize that we should be more careful and also thankful for all that nature still has to offer and how important all the different species of life are. One cannot do without another. So, this was the "educational part" of the blog post LOL! Not too much happened the last couple of days here,we took the days on "low-profile"LOL, meaning we didn;t do too much, most of it was a bit of garnening, what else?? Some weed pulling was done, and a few plants got a different spot, and some of our seedlings seem to start growing, they are still very small, but there is a start. 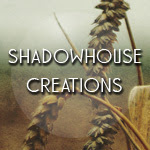 You might have noticed I changed my blog layout again. All with spring/summer in mind, I thought a bright looking one would be appropreate. 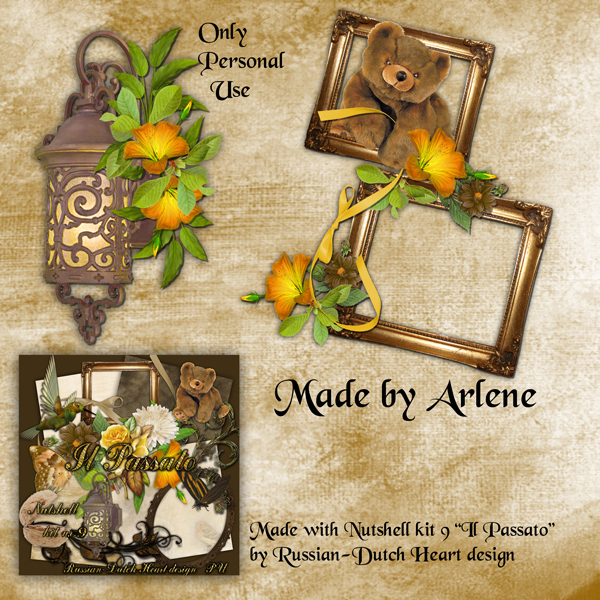 It's made with a Nutshell kit, not posted yet, because it is nr.12 I think, in the serie. Wow, you will have to wait a bit on that to be posted. But do not fear I have another one for you today, also Nutshell, named "Eleganza". I really like how this one turned out. And Arlene has done some marvels with it, one fantastic page border and a quickpage for you! So ladies, that's all for today. I will have to do a bit of house stuff today, may be the sun will come out later today, and then it might be nice to be around in the garden, despite of the wind that blows to hard. We cannot complain about the weather! Oh yes, we definately had some great days. All day long we hd the garden doors opened, we even had to put up the parasol because it was too warm in the sun! Had to buy another bag of soil yesterday, some plants needed a re-potting and oh yes, I think they are all happy again with a bigger pot and fresh soil LOL! You know, it is hard to sit quiet in the chair when in the garden? I managed to do so for a while, as long as I am reading some garden magazines, but when not, the eyes go over and over again through the garden and you ALWAYS see something that needs attention. Perhaps some dead flowers need to be removed, or a little re-arrangement is necessary, or you see some weeds that have to be pulled out, etc.etc.! A gardeners life isn;t always easy hahahaha! Nothing much happened actually, we just treid to enjoy the weather, and try to hypnotise the seedlings to grow faster ROFL. Soon we will have an explosion of color when the azalea will open it's butts. When it does, I should take a picture of it. I do spent a bit less time at the computer these days, due to the weather, so there is a bit less procductivity when talking about designing. But no, I am not complaining, there still are coming news kits out of my hands, and that's enough for the moment. We did wait already a looong time to have better weather, and now it is there to enjoy. I will have to do somes ewing today, at the new trousers of Jan. And it should be done quikcly, so he will be able to wear them and feel more comfortable again, with trousers that don't slip down slowly! We both are a little bit concerned about his weight loss lately. At first he did have to loose some, mostly because of the water-retaining, but that works real well again, only thing is, he is loosing a bit too much weight. And I cannot say he eats less than before, so from where that comes we don;t know. From the last tests he had no strange things came out of it, blood was okay, echo of his belly was okay, so also his doctor has no idea at the moment. Well, in one or two weeks he will have new tests done, let's see if his doctor comes up with a solution. At the moment he stays steady more or less on the weight, but he should have some more kilo's on his bones! Also in a couple of weeks he will have to phone the health security doctor again, to infrom him if he will be able to go to work again I fear, that won;t yet be the case, but he has to do the call and probably a visit too in due time, to secure we will still receive the health security insurance money every month. And it might be they will do reseach on him too, to see if he will be able to work for a certain percentage, if so we will be put in another kind of insurance, and he probably will have to look for another kind of work, or may be the same but for less hours. And then government will pay the diffenrence between his salary and the minimum income level, if he earns less. But the problem will mostly be, fidnging another job. He certainly isn;t able to do any work yet at the moment, he also is still having trouble with his back, it differes a bit from day to day, but not well yet. 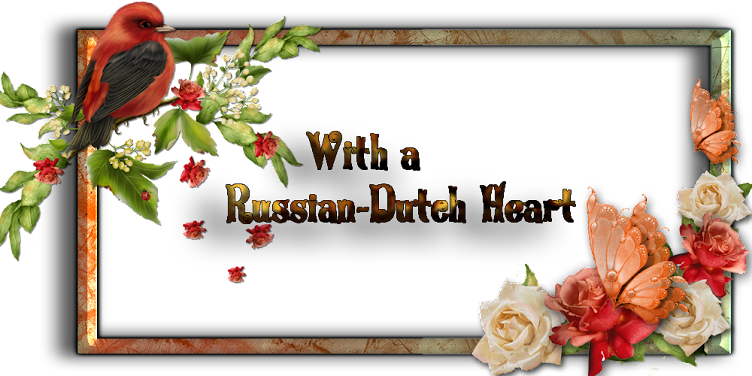 We will see what happens when the time comes, although I must say the health insruance doctor is very accommodating towards Jan, I think he is convinced Jan isnlt taking it lightly, and he knows that he is under treatment and control in the hospital too. Okay, we will take it how it comes, deal with everything that is needed day by day. No use in worrying before it might be needed, isn;t it? I have a nice kit for you today, at least, I think it is LOL! It's named "Always Near To Me", should be a very versatile one. And oh my, look at the add-on from Arlene!!! 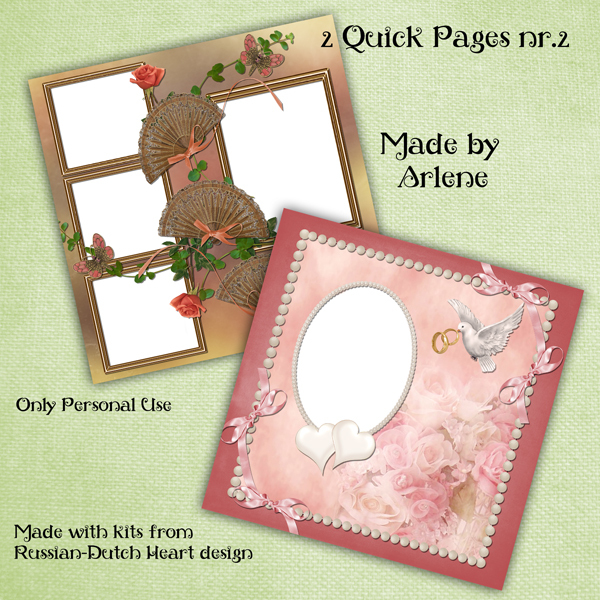 She has made you two pretty quickpages with it and a luster. Enough material to make some memories. Going to enjoy aother nice day, I hope, it's still a bit cloudy and fresh at the moment, but it should clear up later today. Oh I can see some sunshine already. so time for my daily walk through the garden, it's only about just 90 m2, but you can take your time for the control walk, yes every little things has to be inspected closely ROFL! It finally is looking and feeling like spring here. We had some great days, and spent some time of it just in the garden. But not on Saturday. Jan needed a couple of new trouwers, as he had lost weight the older ones are slipping of his bottom LOL. So Saturday we went to city centre to look for some new ones. And we found it, in the first shop we went into. How marvellous. He bought two of them, and they were even for a real nice price too! After we had those, we just went into a couple of other shops, something perhaps like |Wallmart, and oh good heavens, they had some nice seed packets, just for € 0,79 a piece. Couldn;t let them go, so we bought one with six flower species and one with six herb species. And yesterday we put them into pots, now we will have to be patient and see if anythinggrows from it. Also re-arranged some of the pots, cause several plants needed fresh soil or more rom. It was beautiful weather for it, so we really enjoyed being outside. 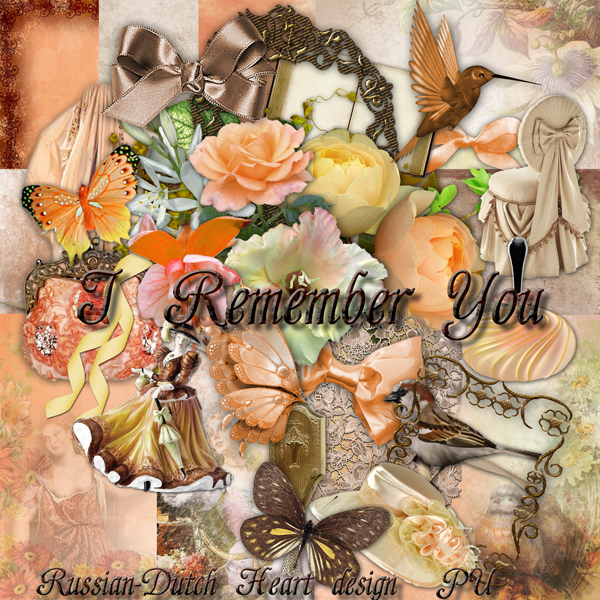 And we weren;t busy all the time, no, also did spent some time sitting in the sun, reading a paper or garden magazine. That was about all we did this weekend. Yesterday evening we watched, among other things, a special concert, attended by the new king and queen, because it was our Liberation day we celebrate each year(Livbration of the WW II), and there were some great performances. On the 4th of May we have the Remembrance Day for all the victims f that war, but in the last couple of years included too all the victims, being soldiers or civilians of all the wars after WW II. I think I will go to the market, just for a short time, we do need some cheese and perhaps some veggies or fruit. On the way to it I also can drop off a bill at the bank that has to be payed. But I will have to be strong when I walk at the market, cause they have a couple of stands there with so many nice garden plants!!!! Yet, I might see one for a real nice price, that just will fit in one pot we have, or just will fit in a little open space we still have LOL! 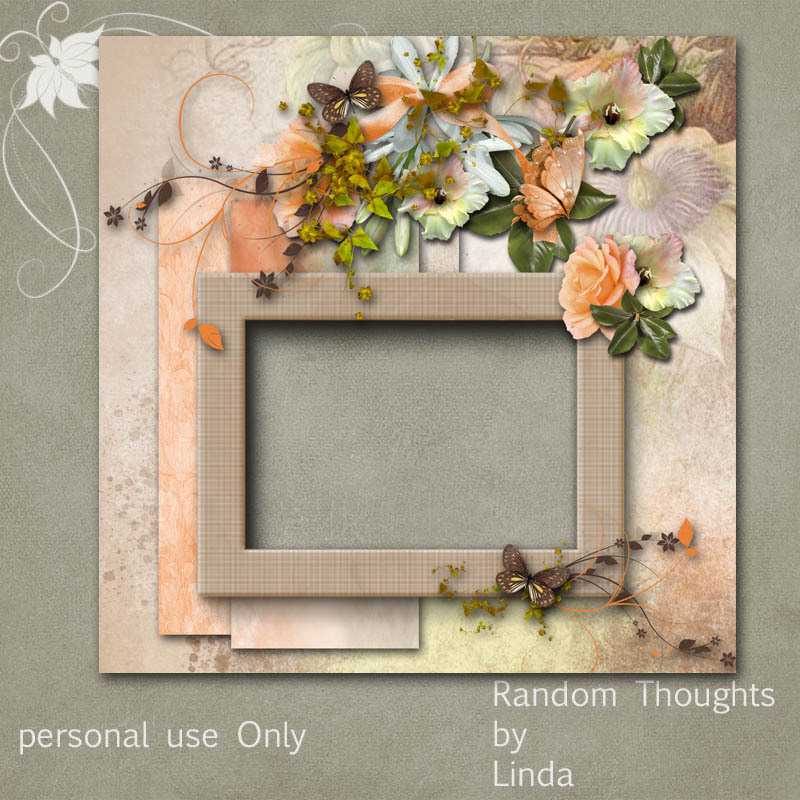 Before posting the freebie, I just have to give you the link to Linda's blog, she recently posted some beautiful quickpages again. 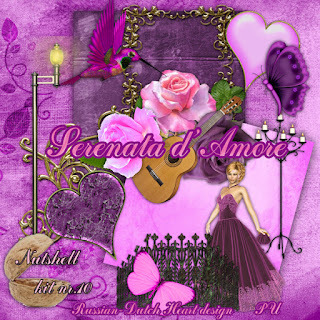 And wat better kit is there, than a Nutshell kit, named Primavera (Spring) ??? 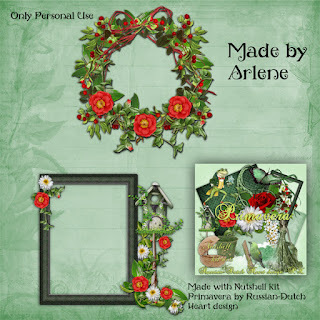 All in a green color scheme, and with two clusters from Arlene. Now I will take a coffee and then hop under the shower and then go to the market, not too late, so I can do some "sun catching"in the garden later today. 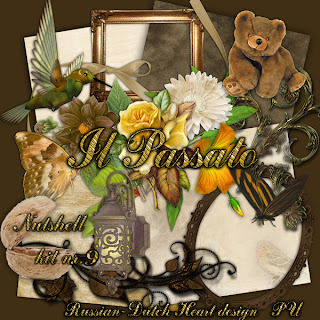 I had to change the shoutbox, because I notice it didn;t show new postings. I did several ones, but nope, nothing! So I found another one, hopefully this one will work. We still have nice weather here, and it looks as if today will be really nice, then tomorrow it's said to rain a little bit(good for the gardens!) and then beginning next week temps are creeping up again. Oh, I can;t wait LOL! I have some a bit miserable photos of the garden. But I wanted to show you how "clean"it looks at the moment, rather empty too, but we are working on that aspect. On this 1st one You can see the left part of it and look at left. Last year we had there a little rock garden, with the tiny little pond for the frogs and toads. Jan cleaned that area and the kind of rock garden moved a couple of meters to the back, placed just behind the Buddha statue and pond you might see. Here a view on the back of the garden. Jan did a LOT of pruning and digging there, and it gives a lot of space. Good for the bushes we have there, they have some "air" to grow a bit, but we will keep a good eye on them and prune them down when necessary. And here a close up from a couple of the new plants we planted last week, standing at the left. It surely gives some happy color in it. Now we are waiting for some seedlings to grow and hopefully after several weeks I can show you a picture of them. If only half of them will do their best and flower, we will be happy. Jan is "watching them out of the soil", he makes a little tour every day in the garden, and if he has spotted a seedling coming up he tells the big news to me LOL! If today it is staying nice weather I think we will spend some time in the garden, nice and quiet in the sun, probably Jan with his crosswords and me looking through a couple of garden magazines. But first I should do some vacuum cleaning at the least, there has to be created some space for new dust binnies, grin grin! 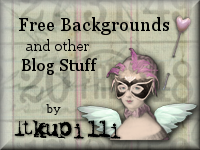 Not much more to tell, so let's go to the freebie for today. 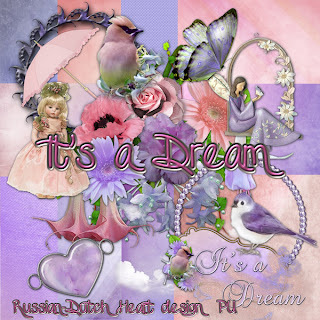 A soft colored kit, named It's a Dream. 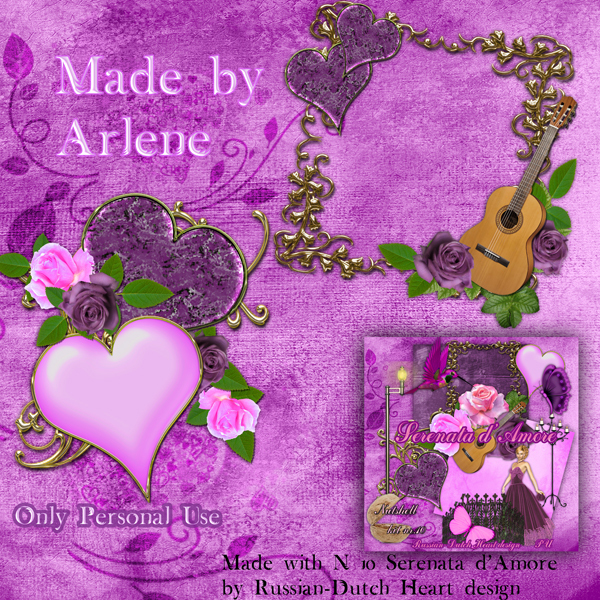 And look at the things that Arlene made you. two clusters, and a beautiful quickpage as well! Time to get another coffee, then get dressed, do something in the house and then hopefully some quiet time in the garden. It was a wonderful day yesterday, we did spent time at the television, but also went out for a moment. It was impressive to watch the inauguration of our King. Some moments were kind of emotional, I dare say. 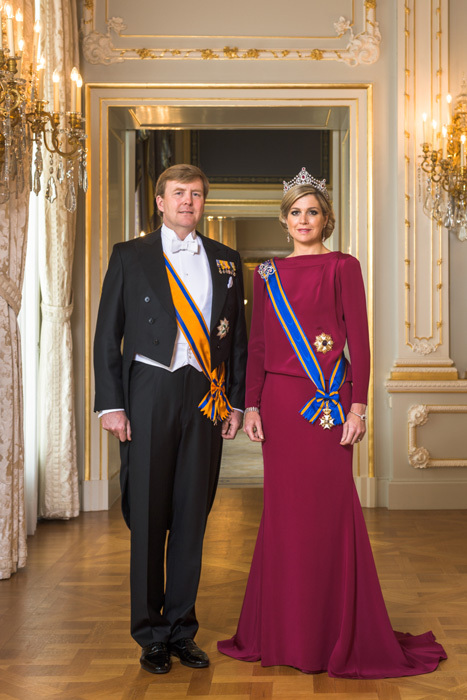 And what to say about our queen Maxima? Wasn;t she looking fantastic????? I gathered a few linkgs for you if you might want to see some pictures and or video's of the day. Specially the last link has lots and lots of photos of the whole day. 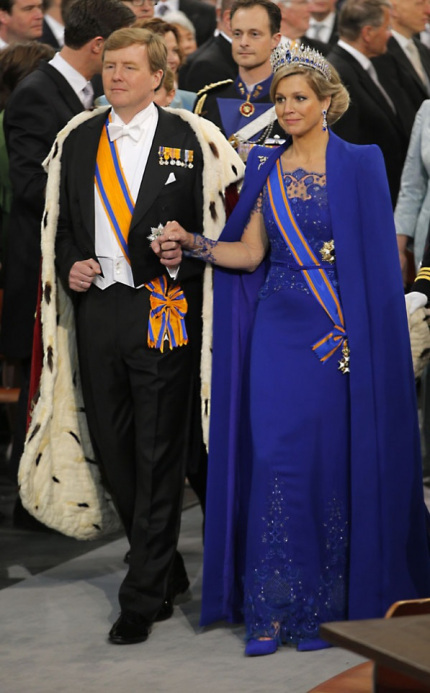 I think the royal couple and their family too, were exhausted at the end of this looong day. Although our king has no real governmental power, they represent our country all over the world and can do a lot of good for the business relations and such and the monarchie is a kind of steady factor in our country and I am proud of them. Do you belive I had sometimes tears in my eyes, e.g. at the signing of the abdication of our former queen Beatrix, and the inauguration of our new king, when he had his speech with some wonderful passages specially for his mother? Sounds perhaps a bit funny, but that are very emotional moments for the family. Perhaps I have too much empathy, well, that's me LOL. We took some of the broadcasting on dvd, so we could watch it in peace later, and we went out to visit a couple of fairs and free markets in the town centre. We even came home with a couple of plants for the garden. It's about time I take a few photos of it, to let you see what barren garden we have at the moment, but also of some of the new plants we planted to bring already some color into it. May be today will be a good day to do so, weather is still improving(not to mention how lucky the royal couple was yesterday, because at least it stayed dry and they even had sunshine, although temperature was rather low), as they say it could reach around 60 F. Pity we still have a cold wind, blowing from the NE, I hope that will change soon towards another direction, because that will bring us more agreable temperatures. Okay, enough rambling done for today, time to share some scrapbooking stuff. 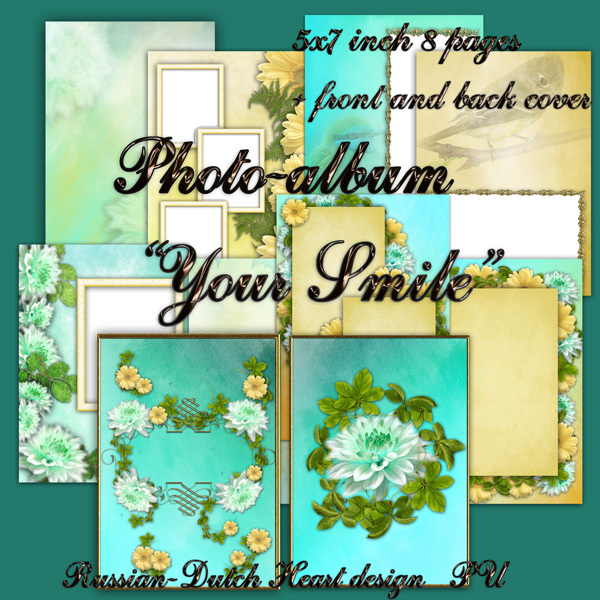 I have a photoalbum of 8 pages for you, with a front and back cover, made this one from scratch, not with an already made kit. 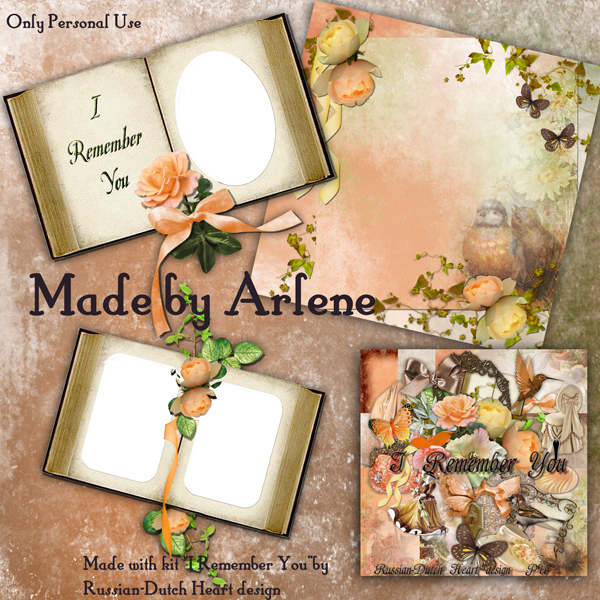 And from Arlene I have two fantastic quickpages for you, she made with a combination of several kits. I hope you will be able to use all of this, on Friday there will be another kit for you.